I was contacted by the owners of a Victorian terraced house in Exeter who had been lovingly restoring the property over the last couple of years and during the work they uncovered this section of tiled flooring and had decided to bring me in to make it look its best. It’s possible that this section of floor was all that was left from when the house was built over 100 years ago and at some point, in the past the rest of the floor was removed and replaced with something more modern. Exeter has an abundance of character properties and there seems to be a bit of a trend to restore period features such as fireplaces and old floors at present. It’s always worth looking under old carpets and vinyl in the search of classic floors such as this, particularly if your neighbours have them, after all it will add value! I visited the property to take a closer look and to take some moisture readings because these old floors were laid without a damp proof membrane and high moisture levels can restrict when this type of work can be carried out due to the sealer needing the floor to be dry(ish) in order to cure. I also did a test clean on one section of the floor to show the customer what level of cleaning could be achieved and inspected the floor for loose tiles to see if any replacement tiles would need to be sourced. With the customers happy with the quote I returned to complete the work starting by protecting the skirting and bottom of the stair carpet. Once done I began the cleaning process by applying a strong stripper/degreaser called Tile Doctor Pro-Clean on to the floor. For best results you need to achieve an even coverage and keeping and check it regularly to ensure it doesn’t dry out. After a short dwell time I set to work scrubbing the floor with a 400-grit diamond burnishing pad fitted to a rotary buffing machine. This really works the cleaning product into the pores of the tiles releasing the dirt and removes any sealers or other old coatings in the process. These large 17” pads do struggle to reach into the corners and edges of the floor however, so I always finish off with a hand-held diamond block. Once I was satisfied that the tiles were as good as they could be I rinsed the floor of the alkaline cleaner and dirty water and extracted the soil using a wet vacuum. Next step was to give the floor what we like to call and Acid Rinse or Acid Wash as some of my colleagues refer to it. We don’t normally use acidic products on tile or stone however they are particularly good at dealing with mineral sales and removing grout smears. Old floors like these are particularly vulnerable to a natural process called efflorescence which results in white mineral salt deposits being left on the surface of the tile as the floor fully dries out and can interfere with the sealer. To counter this, the floor is cleaned with Tile Doctor Grout Clean-up, which is an acid-based product that will neutralise the alkalinity in the floor. The solution is quickly scrubbed into the floor and then rinsed off with water. Before I left for the day I fixed any loose tiles back into place, re-grouted where needed and left an air mover on the floor to aid in the drying of the tiles. If there are radiators in the area I also suggest that they are turned on overnight to further aid the drying process. Occasionally these types of floors need to be left for several days to dry but it is worth the wait and the floors can be used in the meantime provided indoor shoes and socks only are used and care is taken not to get the floor dirty. Upon returning the next day I tested the moisture content of the floor and was pleased to find that it was well within acceptable levels for the application of the sealer that I was planning to use. I quickly checked the floor for areas that I felt may be able to be improved and once satisfied I started the sealing process by applying a single coat of Tile Doctor Colour Grow which is an impregnating sealer that soaks into the pores of the tile protecting it from within and improving the colours in the tile beforehand. This was following with two coats of Tile Doctor Seal and Go that will add further protection and give the floor a subtle satin finish. The customers were thrilled and said that they wished they had brought me in sooner! For aftercare I left the customer with some guidance on care and maintenance of the floor as well as a suitable bottle of neutral tile cleaner. 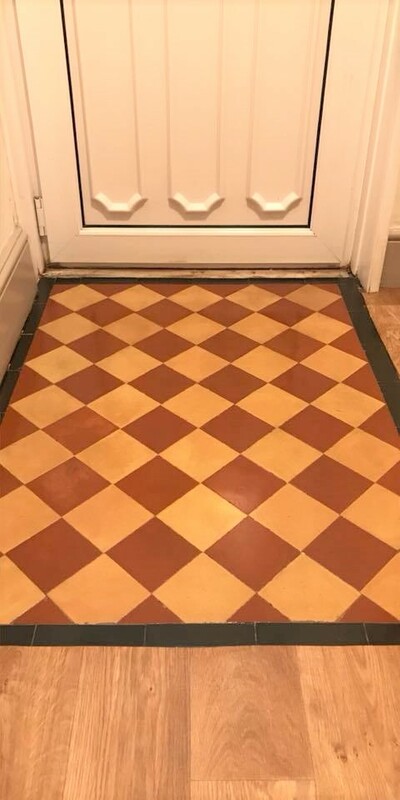 This entry was posted in Victorian Posts and tagged efflorescence, Exeter, hallway, South Devon, Tile Burnishing, Victorian Terraced house, victorian tile, victorian tile cleaning, Victorian Tile Sealing by AbzDominise. Bookmark the permalink.